THE IMPERIAL WAR MUSEUM's northern home will be built on Trafford Wharf on the banks of the Manchester Ship Canal. This great piece of news was confirmed today by Culture Secretary Chris Smith, and marks the culmination of a long process. At one point, the project seemed in doubt, as a Lottery bid was turned down. A later revised bid has proved successful. Most of the money will come from Trafford Centre owners Peel Holdings. The museum building is designed by Daniel Libeskind, and will be based on the concept of a globe shattered into pieces by war. Across from the museum site, on the Salford side of the canal is the Lowry Centre. Visitors will be able to walk to it on a high-tech footbridge currently under construction - pictures coming soon. 33 years ago at Trafford Wharf, I remember visiting the Royal Navy submarine "Grampus". And talking of bridges, the Anderton Boat lift near Northwich is to be repaired with a share of £165,000 in European money. THE 2002 COMMONWEALTH GAMES was also in the news last week - the current question is whether sports like judo or wrestling should be dropped in favour of more crowd-pulling games such as rugby and cricket. And I've received a few enquiries from people wanting to know more about the site, where it is, and how it looks at the moment. Well there it is (above), as I photographed it today. It's situated on a triangle of waste ground approximately two miles east of the city centre in the historic industrial district of Bradford, empty nowadays of the heavy industries which used to be based here. Apart from a lone digger, I saw no activity on the site, which is surrounded by wire fences. But soon, this area will be transformed from a wide empty plot, haunted by the ghosts of Manchester's industrial past, into an ultra-modern sports complex fit for the 21st century. I'll be documenting the transformation in pictures (including QTVR panoramas), so please keep visiting. This is a map I've drawn based on my own knowledge of the area. ALEX FERGUSON, MANAGER OF MANCHESTER UNITED, will be honoured in a testimonial year during the 1999 - 2000 season, it was announced last week. There will be many events including a concert by Simply Red at Haydock Park, a golf day at the K-Club in Ireland, and many others involving thousands of people from celebrities to ordinary members of the public. The idea of the testimonial is to provide an opportunity for people to pay tribute to the achievements of Alex Ferguson, who, few would deny, is the driving force behind Manchester United's current mega-success. The events will be co-ordinated by the company "L'Attitude" set up by Simply Red manager Andy Dodd, and ex-professional footballer, now barrister Kieran Toal, who used to be with Manchester United. And Manchester United continued its run of success yesterday by beating Liverpool 2-1 at Old Trafford. "MUM, I DON'T WANT TO BE BLACK, I'D RATHER BE WHITE, IT'S EASIER" This is what 9 year old Elliott Ramsay told his mum Elaine after returning from his school, Radcliffe Junior School. A song called "Black, Brown and White" was sung at the school at assembly. The offending words, written by a black songwriter over 60 years ago, were intended to be ironic: "If you're white, that's alright, if you're brown, stick around, but if you're black, buddy, get back, get back". Unfortunately, the irony was lost on the pupils of 1999, who chased Elliott, the only black pupil at the school, round the playground, and taunted him. Oh dear, in the words of that other great black songwriter, Marvin Gaye "Why can't we live together?" I'VE RECEIVED A MESSAGE FROM EXPAT MANCUNIAN IAN FLEMING who was recently in the headlines on account of his donation of a kidney to his American wife Teresa. He's appealing for help. And to cheer him up, here's a newly scanned picture of his home district of Newton Heath. EX-MINERS WERE AWARDED £500m GOVERNMENT COMPENSATION at Manchester High Court on Friday. Thousands of them suffer from a condition called vibration white finger, which they gained while working in state-owned pits. AFTER SCANDALS INVOLVING DOCTORS, NOW A DENTIST is facing charges of professional misconduct. The front page of the MEN featured pictures of ex-patients of orthdontist Melvyn Megitt, who for a time was the highest-paid NHS dentist in Britain. If the charges are proved to be true, it would appear he has put his own desire for profit above the welfare of his patients. Once upon a time people looked up to medical professionals and teachers - nowadays, with so much publicity surrounding cases of misconduct, people aren't so sure any more. THERE ARE HUNDREDS OF JOBS GOING AT MANCHESTER AIRPORT - yes, employers there want to recruit 1,100 people for all kinds of jobs. There have been radio adverts, and a jobs fair will take place in Terminal Two on Wednesday. Currently, 16,000 people work at the Airport, employed by 250 firms. And runway protesters will have congratulated themselves on a job well done after they tricked their way into the headquarters of AMEC construction near Northwich. AMEC is one of the main contractors in the construction of the Second Runway, and other major local projects. You'd think their security would have been better - crafty R2 protesters also gained entrance to the celebration dinner at the Piccadilly Hotel and caused a rumpus. But perhaps they ought to be protesting elsewhere - the Second Runway will be built, and nothing can stop it now. 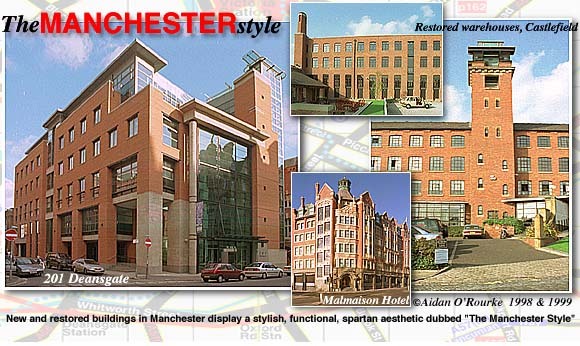 FRIDAY NIGHT WAS MANCHESTER NIGHT on tv - on Michael Parkinson's chat show, we met Caroline Ahern, alias "Mrs Merton". Then we saw a fascinating documentary on The Smiths, featuring in-depth interviews with the band - but not Morrissey, he declined to take part in the programme. Various band members are still involved in an acrimonious dispute over royalties. The documentary also featured some great "car window" footage of Kings Rd Stretford, the Mancunian way and other familiar places - expect to see videoclips like this in Eyewitness in Manchester fairly soon - I was never keen on the Smiths myself, (Ann loves them) but they are undoubtedly one of Manchester's greatest bands, and it's a pity they ended the way they did. MILLIONAIRE BOWDON RESIDENT "BONEHEAD", alias Paul Arthurs of Oasis, is to build a £60,000 studio in the basement of his home. It appears that residents won't be woken up by banging drums and screeching guitar feedback during the night, as he's going to have it soundproofed. The idyllic Victorian village and residential suburb close to Altrincham (I used to visit relatives on Stamford Rd as a child) is regarded as one of the most desirable places around, especially nowadays with well-off retired folk. I've heard Morrissey lives in Bowdon, can anyone confirm this? THE CIVIC SOCIETY HAS LAUNCHED ITS AWARDS scheme for 1999. Categories include Manchester Shop Window, Manchester Renaissance, Victorian City, Manchester Phoenix, Spirit of Manchester, Telecommunications and Energy Efficiency. They're sponsored by Norweb and the Manchester Evening News. Last year the superb 201 Deansgate, featured at the top of this week's page, was one of the winners. And on Wednesday evening, I went to a Civic Society talk at the Friends Meeting House, Mount Street, in which award-winning architect Roger Stephenson gave a talk about his work, illustrated with a show of superb colour slides projected onto two screens. Here's a prime example of the amazing transformation of the city that's going on all around us. This one completed, I believe by Urban Splash, run by Tom Bloxham. What's your favourite, and least favourite building in Manchester? CONCERTS AND EVENTS INCLUDED the Poulenc Centenery Concert, Halle Orchestra, Andy Prior Orchestra and Opera Night at the Bridgewater Hall. The Great Outdoors Show took place at GMEX, opened by larger-than-life Bury actress and "You've Been Framed" presenter, Lisa Riley. Garbage played at the MEN Arena on Friday night. MANCHESTER IS DEARER THAN LOS ANGELES - This headline in Tuesday's MEN follows on from the report featured last week, which places Manchester at the top of the world league as regards cost of living. Here's how Manchester compared with L.A.: Bread (1kg): Manchester 91p/ LA £2.09; Milk (1L): 49p/78p; wine (1L) £5.50/£5.15; 20 cigarettes: £3.40/£1.53; Man's designer suit: £413/£665; tv: £517/£337; low-priced car: £8643/£6239; petrol (1L): 64p/16p. I find it difficult to take these figures at face value. Is bread really that expensive in Los Angeles, and where are they buying their wine from? And petrol for that matter - currently the lowest available price has dipped to 60.9p per litre (£2.77 per gallon). AND WHAT ABOUT THE WEATHER? Well, it's been changeable, cold, damp, and mostly cloudy, but this afternoon there were sunny spells, accompanied by strong winds. 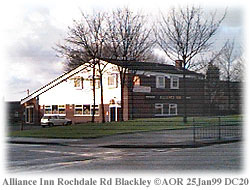 The sun was just about shining as I was taking this photo of the Alliance Inn, Blackley for a reader in Australia. Currently it's 40 fahrenheit, 4.4 celsius outside. THANKS FOR THE POSITIVE FEEDBACK about the new design, which went live on Thursday 21 January at 2.45. Please contact - I love getting e-mail, and I reply to each one individually on the latest messages page. And even if you don't want to be published, I'd still like to hear from you. Also have a look at EWM recommends, linked from the new home page. I'm adding new items all the time. Maps aren't live yet, as I have to obtain a licence from the Ordnance Survey. Hopefully next week.